In his own words – London artist Gary Drostle’s background. So starting at the beginning, I was lucky enough to be born in Woolwich, in South East London, which is a great place. If I ever want a career change I would become a tourist guide for Woolwich. Colouring in and sticking was always the only thing I was good at and soon I was heading off to study fine art. I first attended Camberwell school of Art, then St Martins and Hornsey Colleges of Art in London. 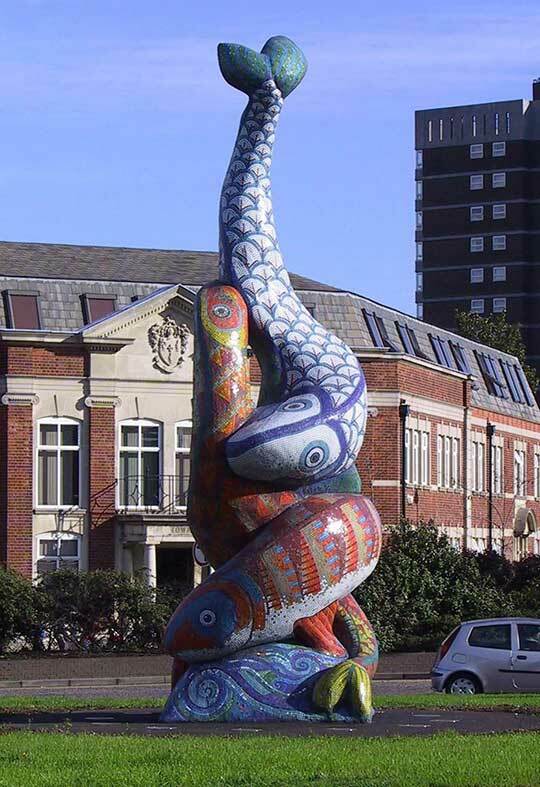 I initially began working as a mural artist for a project for Haringey Hospitals and spent two years painting murals there. Following on from that project I founded Haringey Mural Workshop. At the same time I served on the executive of Haringey Arts Council for two years and worked closely with many different community groups. Haringey Mural Workshop was formed by myself and four colleauges from the Haringey Hospital Arts Project. Artists, Ruth Priestly; Hilary Loebner; JoAnn White; Paul Beaumont and myself formed the mural painting team inspired by Greenwich Mural Workshop from my home town. 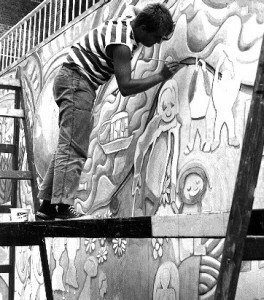 Perhaps our best work as Haringey Mural Workshop, and my first major commission was in 1987 to paint a series of murals for Alexandra Palace – ‘The History of The Peoples Palace’. If you look carefully you can spot a portrait of myself and the team in the mural. After the Mural Workshop disbanded I headed back to my own neighbourhood and formed a new group called Wallscapes initially working with the fab Belfast artist Ruth Priestley. Ruth and I took on our first mosaic commission from my parent’s attic. Aren’t you impressed we got all the material for a 4m x 4metre mosaic up into the attic and then once it was made got it back down again… That first mosaic, ‘Sunburst – the light at the end of the tunnel’, commissioned by the London Borough of Islington, would turn out to be a turning point in my life. 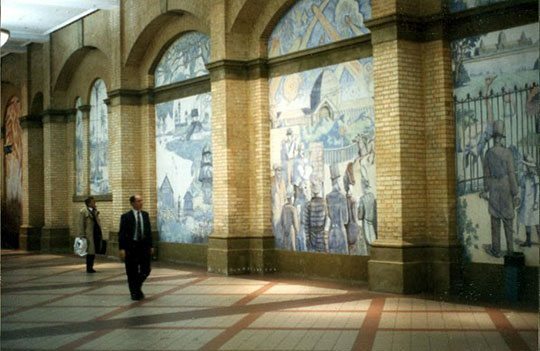 In 1990 Ruth left to go back to Belfast and artist and old St Martins colleague Rob Turner joined Wallscapes. Rob and I went on to work as Wallscapes for over ten years. 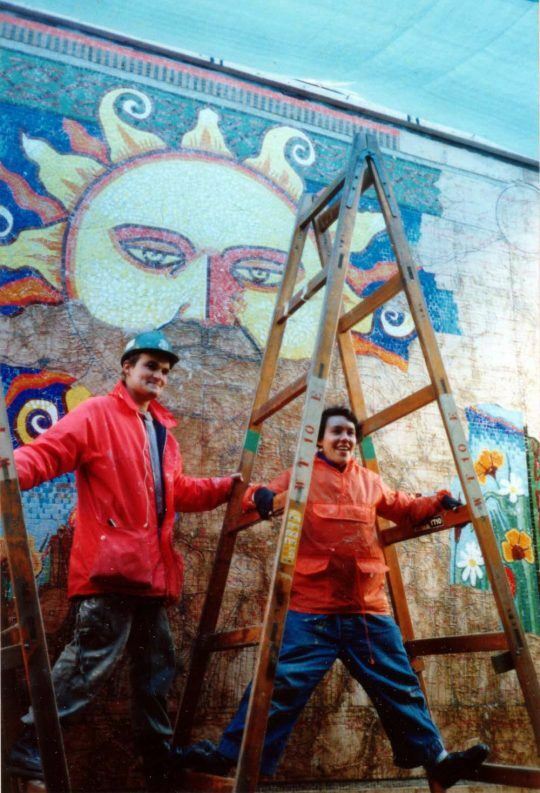 During this time we completed numerous public art projects across the UK, honing and refining our mosaic technique. In 2001 Rob and I decided we needed to go our own ways in order to explore and develop our own work. 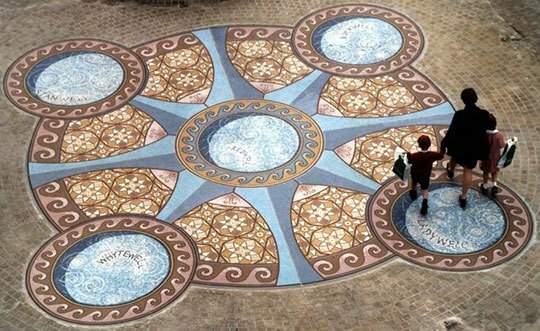 Below, Wallscapes project: The Wellingborough Wells designed by Rob Turner. Since 2000 I have built up a successful studio in south east London creating large scale site specific artworks to my own designs and occasionally collaborating with other artists. With thirty years experience now under my belt and a mantlepiece full of awards my work is now in demand abroad too. Over the last few years I have gained international recognition for my mosaics, completing major commissions in Iowa, Chicago, California and Washington DC. I have also been luck enough to work on community projects in Colombia and Chile. 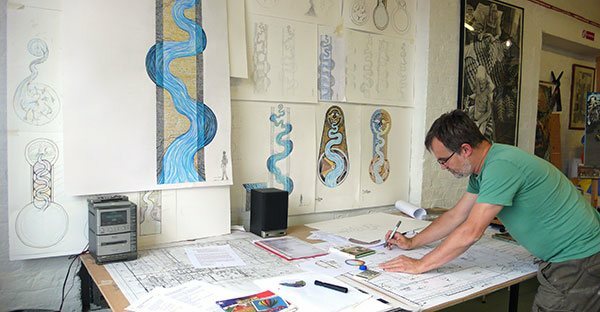 At home I continue to create major public artworks including commissions for TFL – Transport for London, Chester City Council, London Borough of Bexley, The Royal College of General Practitioners and many more. All that experience and commitment has resulted in being elected as Chair and then President of the British Association for Modern Mosaic and being a regular guest lecturer at the Chicago Mosaic School. I have also given keynote speeches, workshops and juried exhibitions at the London conference of the British Association and the San Francisco, Pheonix, San Diego, Austin, Chicago and Detroit conferences of the Society of American Mosaic Artists. Becoming interested in all things mosaic I began looking at the specific British heritage of mosaic art. Unfortunately it soon became apparent that there was precious little information on the more recent mosaic history in the UK. Many of the major mosaic studios operating through the Victorian era, some of which went through to the 1960’s and 70’s had disappeared without trace. So I was very happy to be one of the founders of the BAMM Andamento mosaic journal and be on the magazines editorial board to try and record this fascinating crafts history. Click here see a comprehensive list of the commissioned work to date.